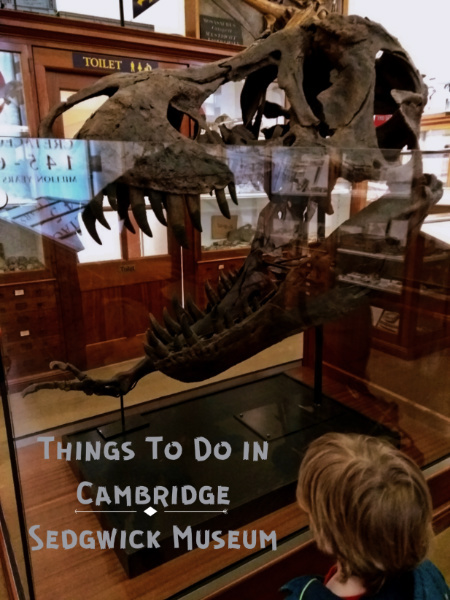 In the Easter holidays we headed to Cambridge to visit the Sedgwick Museum of Earth Sciences and it was fantastic! A quick flick through the Cambridge city section (it also covers the rest of Cambridgeshire, Suffolk and Norfolk) gave me a perfect bucket list of things to do in Cambridge. The list didn’t include looking at a lot of what Ted currently calls ‘castles’ (non-modern architecture). A couple of days after making the list we were on out way to tick the first thing off. , it really is great. As well as being an excellent resource for suggesting days out it’s also got plenty of activities for the kids to do so they really get involved in the day. There’s stickers for them to rate the attraction, jokes, fascinating facts and quizzes. It’s aimed at kids a little older than my two, my copy was a gift for me! We will just have to revisit the attractions in a few years so they can to the activities. We picked the Sedgwick Museum of Earth Sciences for today because they advertised a children’s dinosaur egg event. Turns out I should have read the small print a little better though! They don’t actually have any dinosaur eggs there and the activity was actually to make your own out of paper plates. I shouldn’t start on a negative note though because the Sedgwick Museum is actually incredible! We stepped through an archway, away from a busy road and found ourselves in a quiet courtyard surrounded by imposing university buildings. To our left we spotted a dinosaur sculpture and stone steps guarded by carved bears and we new we were in the right place. Within seconds of stepping through the door David and I had looked at one another and agreed that this place was awesome! As you go in you are greeted by Iggy, an enormous Iguanodon, on your left and Stan, a Tyrannosaurus rex, on your right. The Sedgwick Museum provides some fantastic resources to guide children around the museum. I didn’t try to engage Ted. They were aimed at older kids but I did pick some up to look at later. There’s also a few little things around for them to do, particularly in the newer section off to the right where they also had the egg craft activity running. To be honest though, Ted was happy enough running round from exhibit to exhibit with an equally excited Dad in tow. Ted (age 3) liked the dinosaurs, the interactive displays and the fossils. Ted did not like some of the drier displays and leaving. May (age 11 months) liked dragging her mum the length of the museum. May did not like being told not to bang on the glass. The most amazing thing to us was that it was the Easter holidays and the museum was running an event but it certainly didn’t feel crowded. I love the Natural History Museum, but the dinosaur gallery is ALWAYS too crowded. You end up being swept through by the sheer quantity of people (mostly disinterested school children). None of that at the Sedgwick Museum! We were by no means the only families there but we were able to move back and forth at our own pace. The other thing the Sedgwick Museum has over the NHM dinosaur gallery is the sheer number of fossils on display. The NHM has the big stuff and the fancy interactive displays but for me the small things are fascinating. If I hadn’t been being dragged around by a nearly walking 11 month old intent on using her new shoes to get up and down the stairs I would have been studying the displays of fossil footprints. I realise that’s pretty niche, trust me there’s loads of cool stuff! Check opening times before you go! It’s a small museum so it has limited opening. Our only regret about the day is that we didn’t leave enough time. The Sedgwick Museum closes for lunch at 1pm and so we only had 45 minutes to take it all in. We just about extracted the 3 year old without a tantrum (it was touch and go). We decided to quit while we were ahead and we didn’t return when it reopened at 2pm. It’s a small museum. We did see everything but I could happily have spent more time there. The Sedgwick Museum is on Downing Street, right in the centre of Cambridge. It’s really easy to get to if you are visiting or staying in Cambridge. It is one of several University museums on the street. You could certainly combine a visit to the Sedgwick Museum with a visit to the other museums on Downing Street. The Museum of Zoology is very good too. I would like to visit the Museum of Archaeology and Anthropology just the other side of the courtyard. The Sedgwick Museum is completely FREE! What are your favourite small museums? Do you have any tips for things to do in Cambridge? This post contains affiliate links. If you use them we get a small commission.